At VTD, Inc., we are dedicated to making a difference. One of our company goals is to promote education and the well-being of individuals, especially children in the community, and we take pride in being active members in the community. Below are organizations that we are involved with. Shelter House, Inc.: An organization that provides shelter and services to victims of domestic abuse. VTD, Inc. donated the development of the the Shelter House, Inc. web site and continues to provide maintenance pro bono. In March of 2001, Sherry Smith was awarded "Volunteer of the Quarter". To learn more about this organization, see www.shelterhousenwfl.org. American Business Women's Association: Sherry Smith is an active member of the Emerald Coast Chapter of the American Business Women's Association. 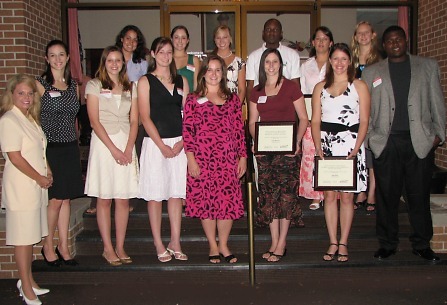 In 2007, Sherry was the Education Chairman, who oversees the awarding of scholarships to local students. She also helps with organizing the fund-raising events for the scholarships and enjoys working with the kids. Sherry Smith won the 2005 Woman of the Year for the American Business Women's Association Emerald Coast. In 2008, she was selected as one of their Business Supporters of the Year! White-Wilson Community Foundation: VTD, Inc. is very involved with the WWCF, particularly with the Little Black Dress Party, an event started by White-Wilson in 2010 to raise money for local charities and to help raise awareness and education on the importance of preventive healthcare. Okaloosa Walton Homeless Continuum of Care: We designed the web site for the organization, work on their fundraisers, and collect items for the homeless. We are very passionate about this cause! If you'd like to learn more about how you can help, visit www.okaloosawaltonhomeless.org. American Heart Association: VTD, Inc. has worked on committees to organize the annual Heart Ball in the local area and donated a free web site as an auction item in 2000. American Cancer Society: Sherry often participates in the local Relay for Life event in remembrance of those friends and family lost and to celebrate with those that have survived this disease.